Even after your opponents have given up frustrated, tired and angry, you'll still be able to pwn your way ahead thanks to the ergonomic right-handed design of the Razer DeathAdder. Its contours fit perfectly to your hand, making it comfortable at all times and keeping you alert all night long. The Razer DeathAdder has been extended with the world's first optical 6400 dpi sensor. Reach a new level of precision and speed while enjoying the natural feeling of movement that so many players love about optical sensors. You can also calibrate the mouse to your specific surface and customize cut-off-to-lift-off tracking to give you even more control at tournament level. With online cloud support, Razer takes your gaming experience to the next level. Save your Razer DeathAdder user profiles (as many as you can create, so infinite numbers) and synchronize them from anywhere in the world via our cloud system. In addition, drivers and firmware updates are downloaded automatically. It is also your central point of contact for finishing off your mouse settings. Set all options exactly, from lift-off tracking and surface calibration to enabling communication between devices... All features that can be set are waiting for your fine tuning. 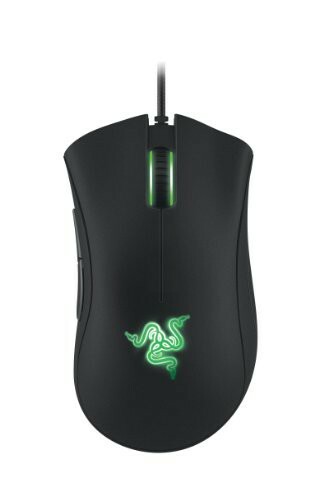 The Razer DeathAdder offers everything for professional players and is also suitable for competitions. The latest version of the Razer DeathAdder features textured rubber grips on the sides for easier control under your fingers. Whether you're a less sensitive player who lifts the mouse all the time, or a player who plays with high sensitivity and moves the mouse at incredible speeds, these handles make sure that the mouse stays safely in your hand. There are reasons why the Razer DeathAdder is the world's most popular gaming mouse and a favorite of professional players. Their design matches their functionality and gives you exactly what you need - a mouse made to win. It has not yet written a review for razer DeathAdder 2013 Ergonomic Gaming Mouse 6.400 dpi.